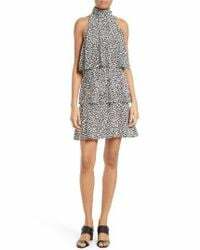 See more Tracy Reese Casual and day dresses. We check over 450 stores daily and we last saw this product for $163 at Nordstrom. A trio of fluttery tiers shapes a flirty, flouncy shift that pulls the eye to pretty shoulders with halter-inspired styling.